It’s suggested that you should never let anyone touch your crystals. Each crystal should be cleansed before use to clear any stored energy. Place your crystal by a window. Soak crystal in sea salt or epsom salts. Throughout history, civilizations have had many uses for crystals. The oldest legend goes back to the ancient times of Atlantis. It was said that the people of Atlantis were highly evolved and used crystals to channel and release the cosmic forces. The legend declares that this sacred knowledge was abused and Atlantis was destroyed, but before it was destroyed the wise one's of the civilization programmed certain crystals with the information and planted them in the earth, trusting that the crystals would surface on the planet to be attracted to people who could attune their minds to receive the information stored within. Mayan and American Indians in the past have used crystals for diagnosis and treatment of disease. Crystal healing work means transcending our self and ego. It works with a combination of the mind, the will, the crystal and the spirit becoming a channel though which spirit can do its work. To become this channel, you need to learn to surrender and become centered, calm and focused. What are crystals? Crystals are composed of minute particles called atoms that are grown within Mother Earth, they carry certain vibrations. Crystals are capable of receiving, projecting, reflecting light (which is the highest form of energy known in the physical universe). Nearly all crystals are created by repetitive adding of new matter to the growing crystalline mass. Some have their origins in fiery gases, some from vapors of volcanic gases and some from water solutions. You can use Crystals with Reiki to help change a number of inner processes, to do healing, to energize and balance the bodies energies. Just having them in your environment brings more beauty and light into your environment, they will charge the area with energy, they can purify and restore peace. You can carry or wear the crystal to bring light and energy into your day and have an effect on people who drain your energy or constantly have a negative attitude. You can use any crystal in meditation to absorb its healing properties. When crystals are used for healing purposes, they will be open to picking up energy of the individuals that they are working with and should be cleansed after each treatment. You can run them under cool water and put them in a window or outside with sunlight (for at least 30 min) or on a large quartz cluster to cleanse and recharge. You will tell if they need energized, they will become dull and clouded. You can personally recharge your crystals by holding them in your hand and sending them your own healing energy. For those crystals that are very drained you can soak them in sea salt and leave it for a couple days, then rinse it in cool water and put in the sun, then personally recharged. You can use Reiki to cleanse any type of crystal, simply holding the crystal and intending that it should be cleansed. You can write down any problems you are having on paper and place a crystal under it intending that the Reiki flow into the problem to create healing. Crystal healing is an effective method of cleansing the aura, releasing suppressed traumas and connecting a person with their source of truth and power once old patterns are released. Crystals help by increasing the amount of light. The increased energy serves to get rid of unreleased blocks of negative charged energy. The frequencies of light that crystals emit are important. They have a direct influence on the bodies biochemical processes. Crystals are powerful when used in conjunction with the body's energy centers, the Chakras. Each chakra has a specific vibrational colour . Old feelings and memories may surface and be expressed when crystal's are used.. The purpose of crystal healing is to help those whom you work with to balance and align the physical, mental, emotional and spiritual bodies so that they can get at their own inner resources of power and truth. True healing happens when you take full responsibility for yourself and when you do, you claim the power to heal. Desert Rose: Provides alignment of the chakras and meridians of the physical body. Emits energy to strengthen our commitment to our lives work and gives us stability in employment. Hematite: (Silvery black) A stone for balancing the mind, body and spirit. It balances our Ying and Yang energies. It also balances the meridians within the body. Moldavite: (Green) Moldavite works on our higher chakras. It facilitates strong, clear interdimensional connectedness between our consciousness and higher planes of light. It provides us with the image of eternity and the vision and energy to translate the image into reality. Peridot: (Pale green) A stone of inspiration, purification, growth, intuition, healing, renewal and rebirth. It is soothing to the nerves and alleviating anger. It's wonderful for stress reduction and relaxation. Chakra: Heart. Rutilated Quartz: (Clear to brown) Helps us connect to the root of our problems, hence providing the reason for disease or discomfort so we may fix the situation. Seraphinite: (Deep green with silvery iridescent markings) It is said that this is the most effective stone for cellular regeneration and can cause a flush of pure healing energy. It acts as a trigger, causing old patterns of disease or imbalance to all away and new patterns to be created. It is the premier healing stone of this age. It is the tool most suited to bringing the physical body into line with the Light energy. While the beautiful green shade is perfect for the heart chakra, it can be used on any chakra or any other part of the body where enhance and harmonized energies are desired. Sugelite/Royal Azel: (Opaque, purple with dark indigo or magenta shadings) Helps to gain higher awareness of one's spiritual essence by opening the third eye and stimulating a mental understanding of our connection to the Universal and our purpose. Promotes inner strength and grace. It activates and balances the brain hemispheres. Strengthens the heart and aids in the physical healing and purification of bodily functions. Sugilite can reduce stress and turn higher spiritual awareness into physical reality. Strengthens spirituality, channelling and psychic ability. Works with the crown and third eye chakras. Tanzanite:(Violet/Blue) Tanzanite A calming stone which is ideal for use when your life becomes extremely busy, disorganized or chaotic. Tanzanite can help to bring your life back into balance. One of the most powerful stones used for helping to connect the throat, third eye and crown chakras. A "Self-Esteem Crystal". Carnelian is used to help restore feelings of inadequacy and low self-esteem. The deep orange colors relate well to strengthening and blending the 1st, 2nd, and 3rd chakras, promoting self-security and self-love. The pinker shades relate to enhancing love between child and parent, through self-acceptance. This crystal is also used for dermatological ailments such as acne, by holding the stone over the skin and moving it in circles for several minutes, several times a day. Pacifies, soothes, harmonizes. Balances energies, especially male/female. Helps one attune to spiritual dimension, especially distant past. Amazonite acts to soothe and pacify the emotions, calm the nerves and eliminates aggravation and negative energies. It soothes all the chakras and rejuvenates the heart & throat chakras. Stabilizes central nervous system. Enhances communication, memory and brain functions. General health maintenance, helps resist tooth decay, osteoporosis & dispels muscle spasms. Highly calming and stabilizing. Promotes aura healing, energy balance and cleansing. Helps manifest desired state of reality. Stimulates intellect & opens the crown chakra. Protects against psychic and negative attacks. Protective shield. Can improve the functions of the brain and nervous system, release anxiety & increase clarity of mind. Detoxify & alleviate depression. Purify body, mind & spirit. Treatment of goiters and throat diseases as well as kidneys & bladder. Used as symbol of renewal of marriage vows and to keep promises. Opens consciousness, especially for empaths. Promotes spirituality & contentment. Aids spiritual insight & intellectual reasoning. Introduces guides and angels. Aids in mediation, helps insomnia, headaches, and alcohol recovery. Treats disorders of hearing, nervous system, digestion tract, heart, stomach, skin and teeth. Eases stress. Calmness & Clarity integrates and balances all systems of the body. Stimulating & motivating. Forces your focus onto the physical plane and minimizes psychic perceptions and distractions. Cleanses the blood. Encourages living and moving forward on your life path and helps prevent distractions. Aids in earth plane achievements. Encourages balance of energy. Promotes responsible sexuality. Aids creativity. Raises moods. Stimulates, balances and heals women’s reproductive system. Aids non-inflammatory arthritis. Stimulates analytical capabilities & precision and protects against envy, fear, rage & sorrow. Dispels apathy, indolence & passivity. Detoxifies and cleanses. Regenerates tissue. Clears, expands and aligns the aura. Stimulates intellect and mental activity. Aids urinary and kidney problems. Balance digestive & nervous systems. Energizes the sacral chakra and gentle grounding effect. Dissipates negative energy. Works out problems. Does not absorb energies. Opens your heart to others and increases trust in life, self-confidence & and optimistic outlook on life. Improves eyesight. Fosters light heartedness. Cleanses the heart chakra of fear, soothes physical and emotional heart pain. Heals heart dis-eases, infections. Used to treat disorders of lungs, heart, adrenal glands & muscular & urogenital systems. Brings about adventures in love and travel. Grounds and stabilizes. Brings to a steady focused state. Heals anger and rage. Fosters peace. Helps you to face and heal your dark side. Helps prevent bleeding. Strengthening influence on the physical body – especially blood, body temperature & circulatory system. If fully balanced – can provide access to spirit travel and astral worlds. Assists with Math pursuits & development of mental and manual dexterity. Healing stone. Dream Stone. Opens qualities of mercy, compassion, inspires awareness & oneness of all. Frees from anger, selfishness, & greed. Encourages service to others. Helps encourage you on your path to enlightenment. Heals hips, kidneys, heart & spleen. Increases ambitions & goals & assists with accomplishing objectives. Connects the emotional & mental bodies to your life purpose & physical action. Protects & clears the aura of negative energy, & psychic attacks. Open eye/vision charkas. Aids the ability to see & communicate positively with others. Fosters consciousness of life purpose. Instigates rapid frequency shifts to remove blockages & establish new patterns. Excellent for energy protection, preventing negativity from attaching to you and prevents energy drains. Brings together mental body/mind changes. Helps bring spiritual information to the mind. Opens channels for clearer communication with animals and others. Physical coordination, dexterity, balance & learning skills. Helps maintain skeletal system. Aids grounding. Stabilizes. Enhances security & safety. Calms confusion & over-activity. Encourages Earth awareness & responsibility. Helps understanding of Mother Earth and your place on the planet. Heals fear, depression, addictions, and obsessions. Good for meditation. Used to further business & increase profits. Stone of gentle love. Promotes heart healing through positive self-love, self-esteem, and self-image. Aids the emotional body. Fosters acceptance, inner peace, forgiveness, and self-forgiveness. Eases fear, stress & trauma. Soothes grief. Reduces aggravating & aggressive conditions. Balances the pituitary gland and third eye. Heals the lymphatic and glandular systems, nerve endings, vision nerves, & body fluids. Encourages beginning psychic vision. Aids in letting go of control and trusting in the creator. Soothes and heals the central nervous system. Deep level of peace. Tiger Eye has the energies of the Sun and the Earth. It produces soothing vibrations. Can be used in the treatment of the eye and the throat, strengthen spinal column and mending broken bones. Can aid in night vision, and communications. Makes one invisible to negative energy. Protects against psychic attacks. Returns negative energy to sender. Clears negative energy from the solar plexus. Protects travelers and autos from accidents. Aids in seeing evil. Aids physical vision, throat disorders & reproductive system. Clears diaphragm chakra of toxic emotions and old pain. Releases anger & resentment and vengeance to conscious awareness for clearing. Forces changes of negativity through awareness. Helps you realize the oneness of all life. Used in treatment of the reproduction system & stimulates healthy pregnancies & healthy babies. It is fair to say that as long as we have existed as a species, we have had an affinity with stones and crystals. The use of talismans and amulets dates back to the beginnings of humankind, although we have no way of knowing how the earliest of these objects were viewed or used. Many early pieces were organic in origin. Beads carved of mammoth ivory were excavated from a grave in Sungir, Russia, dating back 25,000 years (Upper Palaeolithic period), and there are contemporary beads made from shell and fossil shark's teeth. The oldest amulets are of Baltic amber, some from as long as 30,000 years ago, and amber beads were discovered in Britain from 10,000 years ago, the end of the last ice age. The distance they travelled to reach Britain shows their value to the people of that time. Jet was also popular, and jet beads, bracelets and necklaces have been discovered in Palaeolithic gravesites in Switzerland and Belgium. There have been malachite mines in Sinai since 4000 BC. The first historical references to the use of crystals come from ancient Sumaria, where they were included in magic formulas. The ancient Egyptians used lapis lazuli, turquoise, carnelian, emerald and clear quartz in their jewellery, and carved grave amulets of the same gems. Stones were used for protection and health. Chrysolite (later translated as both topaz and peridot) was used to combat night terrors and purge evil spirits. Egyptians also used crystals cosmetically. Galena (lead ore) was ground to a powder and used as the eye shadow known as khol. Malachite was used in a similar manner. Green stones in general were used to signify the heart of the deceased, and were included in burials. Green stones were used in a similar way at a later period in ancient Mexico. The ancient Greeks attributed a number of properties to crystals, and many names we use today are of Greek origin. The word 'crystal' comes from the Greek word for ice, as it was believed that clear quartz was water that had frozen so deeply it would always remain solid. Amethyst means 'not drunken', and was worn as an amulet to prevent drunkenness. Hematite comes from the word for blood, because of the red colouration produced when it oxidises. Hematite is an iron ore, and the ancient Greeks associated iron with Mars, the god of war. Greek soldiers would rub hematite over their bodies before battle, probably to make themselves invulnerable. Greek sailors wore a variety of amulets to keep them safe at sea. Jade was highly valued in ancient China, and some Chinese written characters represent jade beads. Musical instruments in the form of chimes were made from jade, and around 1000 years ago emperors were sometimes buried in jade armour. There are burials with jade masks from around the same period in Mexico. Jade was recognised as a kidney healing stone both in China and South America. More recently, dating from around 250 years ago, the Maoris of New Zealand wore jade pendants representing the ancestor spirits, which were passed down many generations through the male line. The practise of wearing 'green stone' pendants carries on there today. Crystals and gemstones have played a part in all religions. They are mentioned throughout the Bible, and in the Koran. The origin of the stones we attribute to various birth signs is the breastplate of Aaron, or high priest's breastplate, mentioned in the book of Exodus. In the Koran, the 4th Heaven is composed of carbuncle (garnet). The Kalpa Tree, which represents an offering to the gods in Hinduism, is said to be made entirely of precious stone, and a Buddhist text from the 7th century describes a diamond throne, situated near the Tree of Knowledge (the neem tree under which Sidhartha meditated). On this throne a thousand Kalpa Buddhas reposed. The Kalpa Sutra, in Jainism, speaks of Harinegamesi, the divine commander of the foot troops, who seized 14 precious stones, cleansed them of their lesser qualities, and retained only their finest essence to aid his transformations. There is an ancient sacred lapidary treatise, the Ratnapariksha of Buddhabhatta. Some sources state that it is Hindu, but it is most likely Buddhist. The date is uncertain, but it is probably from the 6th Century. In this treatise, diamonds figure highly, as the king of gemstones, and are ranked according to caste. The Sanskrit word for diamond, vajra, is also the word for the Hindu goddess Indra's thunderbolt, and diamonds are often associated with thunder. The ruby was also highly revered. It represented an inextinguishable flame, and was purported to preserve both the physical and mental health of the wearer. The treatise lists many other gemstones and their properties. In Burma, stones, especially rubies, were inserted into the flesh to become part of the wearer's body, in the belief it would make them invulnerable. Amulets were banned by the Christian church in 355 AD, but gemstones continued to play an important role, with sapphire being the favoured gem for ecclesiastical rings in the 12th century. Marbodus, the Bishop of Rennes in the 11th century, claimed that agate would make the wearer more agreeable, persuasive, and in favour of God. There were also many symbolic references, such as the carbuncle representing Christ's sacrifice. In Europe, from the 11th century through the Renaissance, a number of medical treatises appeared, extolling the virtues of precious and semi-precious stones in the treatment of certain ailments, alongside mainly herbal remedies. Authors included Hildegard von Bingen, Arnoldus Saxo, and John Mandeville. 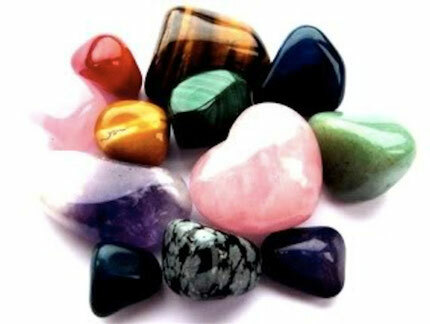 There are also references to stones with particular qualities of strength or protection. In 1232 Hubert de Burgh, the chief justicular of Henry III, was accused of stealing a gem from the king's treasury which would make the wearer invincible, and giving it to Llewellyn, the King of Wales and Henry's enemy. It was also believed that gemstones were corrupted by the original sins of Adam, could possibly be inhabited by demons, or if handled by a sinner, their virtues would depart. Therefore, they should be sanctified and consecrated before wearing. There is an echo of this belief today in the cleansing and programming of crystals before use in crystal healing. During the Renaissance the tradition of using precious stones in healing was still accepted, but the enquiring minds of the period sought to find out how this worked, and give it a more scientific explanation. In 1609 Anselmus de Boot, court physician to Rudolf II of Germany, suggested that any virtue a gemstone has is due to the presence of good or bad angels. The good angels would confer a special grace to the gems, but the bad angels would tempt people into believing in the stone itself, and not in God's gifts bestowed on it. He goes on to name certain stones as helpful, and put other's qualities down simply to superstition. Later in the same century, Thomas Nicols expressed in his 'Faithful Lapidary' that gems, as inanimate objects, could not possess the effects claimed in the past. Thus, in the Age of Enlightenment, the use of precious stones for healing and protection began to fall from favour in Europe. In the early part of the 19th century, a number of interesting experiments were conducted to demonstrate the effects of stones on subjects who believed themselves to be clairvoyant. In one case, the subject claimed to feel not only physical and emotional changes when touched with various stones, but also to experience smells and tastes. Many tribal cultures have continued the use of gemstones in healing until very recently, if not through to the present day. The Zuni tribe in New Mexico make stone fetishes, which represent animal spirits. These were ceremonially 'fed' on powdered turquoise and ground maize. Beautiful inlaid fetishes are still made to sell, and are very collectable artefacts or sculptures, although the spiritual practise surrounding them is no longer much in use. Other Native American tribes still hold precious stones, especially turquoise, sacred. Both Aborigines and Maoris have traditions regarding stones and healing or spiritual practise, some of which they share with the rest of the world, while some knowledge still kept private within their communities. It is interesting to note that there are many examples of gemstones meaning similar things to different cultures, even when there has been absolutely no interaction between these cultures, and no opportunity for crossover. Jade was considered to be a kidney healing stone by the ancient Chinese, and also Aztec and Mayan civilisations, turquoise has been worn to give strength and health all over the world, and jaspers have almost always conferred both strength and calm. In the 1980s, with the advent of the New Age culture, the use of crystals and gemstones began to re-emerge as a healing method. Much of the practise was drawn from old traditions, with more information gained by experimentation and channelling. Books by Katrina Rafaell in the 80s, and Melody and Michael Gienger in the 90s, helped to popularise the use of crystals. These days there are a large number of books available on the subject, and crystals frequently feature in magazine and newspaper articles. Crystal therapy crosses the boundaries of religious and spiritual beliefs. It is no longer viewed as the domain of alternative culture, but as an acceptable and more mainstream complimentary therapy, and many colleges now offer it as a qualification subject.